I missed it by a few weeks. On May 21, 1927, the aviator Charles A. Lindbergh landed his Spirit of St. Louis near Paris, completing the first solo airplane flight across the Atlantic Ocean. Lindbergh was just 25 years old when he completed the trip. He learned to fly while serving in the Army and was serving as a United States Mail pilot when the New York hotelier Raymond Orteig announced a $25,000 prize for the first pilot to fly nonstop from New York to Paris, or Paris to New York. 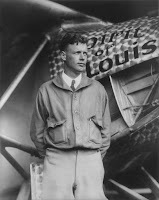 Lindbergh received financial support from a group of St. Louis businessmen to build a single-engine plane to make the journey. He tested the plane, called the Spirit of St. Louis, with a record-setting flight from San Diego to New York. $25, 000 in 1927 is now worth a little over $350, 000. Today we think nothing of flying across country or across oceans non-stop. Someone successfully pushed the envelope. It didn't have to be Lindbergh, but it was. unknown today. Many Americans think Lindbergh made the first crossing; Englishmen applaud Alcock and Brown. At the time, some thought it not "sporting" that the Navy placed ships along the route to aid navigation, and that the flight took so long to accomplish. Still the NC-4 was, and ever shall remain... First Across the Atlantic! But Lindbergh caught the imagination of the people and the rest is . . . progress. It still takes brave men and women to accomplish such things. Brave and prepared men and women. nc-4 piloted by lt. elmer stone uscg.